P. Z. c'x, C.I.E., Political Resident A senior ranking political representative (equivalent to a Consul General) from the diplomatic corps of the Government of India or one of its subordinate provincial governments, in charge of a Political Residency. in the Persian Gulf Historically used by the British to refer to the sea area between the Arabian Peninsula and Iran. Often referred to as The Gulf or the Arabian Gulf. .
Russfan and British Governments. Please as soon as possible have report sent. Copy of a telegram No. tsg, dated 16th March , 9 o 7 ,from Major P. Z.
Cox, C.I.E., Political Resident A senior ranking political representative (equivalent to a Consul General) from the diplomatic corps of the Government of India or one of its subordinate provincial governments, in charge of a Political Residency. in the Persian Gulf Historically used by the British to refer to the sea area between the Arabian Peninsula and Iran. Often referred to as The Gulf or the Arabian Gulf. 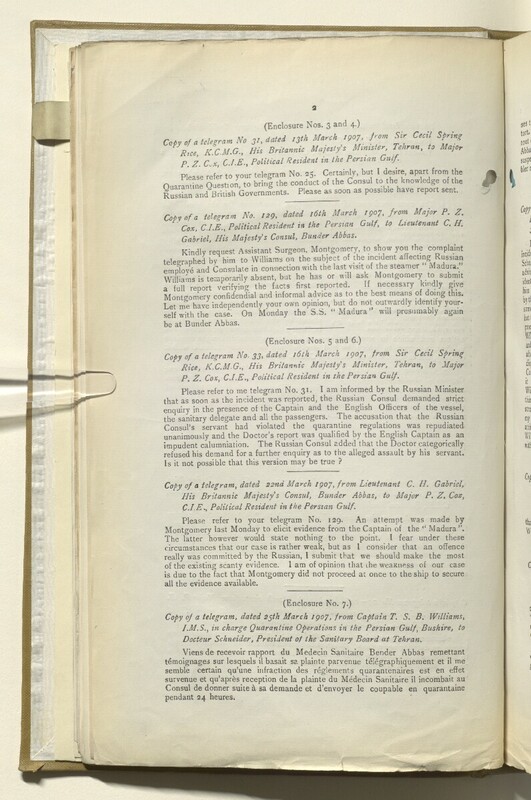 , to Lieutenant C. H.
Gabriel, His Majesty's Consul, Bunder Abbas. emnlovd and Consulate in connection with the last visit of the steamer Madura. Montgomery confidendial and informal advice as to the best means of doing this. P. Z. Cox, Political Resident A senior ranking political representative (equivalent to a Consul General) from the diplomatic corps of the Government of India or one of its subordinate provincial governments, in charge of a Political Residency. in the Persian Gulf Historically used by the British to refer to the sea area between the Arabian Peninsula and Iran. Often referred to as The Gulf or the Arabian Gulf. .
refused his demand for a further enquiry as to the alleged assault by his servant. Is it not possible that this version may be true ? C.I.Ey, Political Resident A senior ranking political representative (equivalent to a Consul General) from the diplomatic corps of the Government of India or one of its subordinate provincial governments, in charge of a Political Residency. in the Persian Gulf Historically used by the British to refer to the sea area between the Arabian Peninsula and Iran. Often referred to as The Gulf or the Arabian Gulf. .
Montgomery last Monday to elicit evidence from the Captain of the <f Madura”. Docteur Schneider, President of the Sanitary Board at Tehran.